We’ve got your back when it comes to protecting your biggest investment, your home. NZCB partnered with one of the largest insurance underwriters in the world, Lloyd’s of London, to bring you Halo – the most comprehensive 10 year residential building guarantee on the market. It’s a unique, independent building cover that’s only available to people who build or renovate with an NZCB approved builder. Rest assured that in the unlikely event something happens to your builder or NZCB itself during your building project, you won’t be out of pocket. Plus, if you sell your property within 10 years, the guarantee automatically passes over to the new owner. Extra costs to complete the dwelling. Structural defects for 10 years including weather tightness. Non-structural defects for ten years. Moving into your new or renovated home should be hassle-free and rewarding. 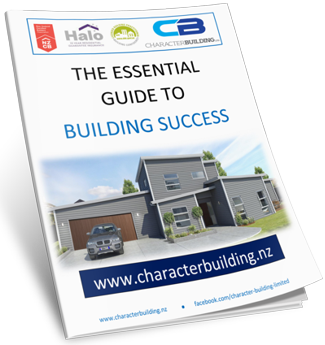 With Character Building who is an NZCB approved builder, with a solid reputation built on the highest standard of knowledge, skills and expertise you’ll get just that. This amazing e-book will show you, step by step, every aspect of a new build that you need to consider for your next home. You’ll also get tips which could save you thousands of dollars in unwanted, and unnecessary costs and time. Please fill in the form below to get a link to your free copy. Looking for a quality and experienced builder for your next New build or Renovation? From the initial consultation to the day we hand you the keys to your new home we will be there with you guiding you, relieving you of your stresses and ensuring you have an enjoyable exciting build process, but most importantly ensuring you get the home you deserve. Copyright © 2015 - Character Building Ltd. All rights reserved.